In Hear This, A.V. Club writers sing the praises of songs they know well—some inspired by a weekly theme and some not, but always songs worth hearing. This week, with Let’s Be Cops coming to theaters, we’re picking our favorite songs with “let’s” in the title. Even by the grimy, grotty standards of punk rock, few matched the glorious ugliness of Swell Maps. The British group—founded by brothers Nikki Sudden and Epic Soundtracks—roared onto the landscape like the whine of a busted speaker, which would have easily been the most sophisticated piece of equipment the band used to make its earliest recordings. Eventually it evolved beyond employing headphones as microphones and rewired bits of radios and random plumbing to make its clatter, which resembled Can and The Clash having a conference call over a spotty connection. 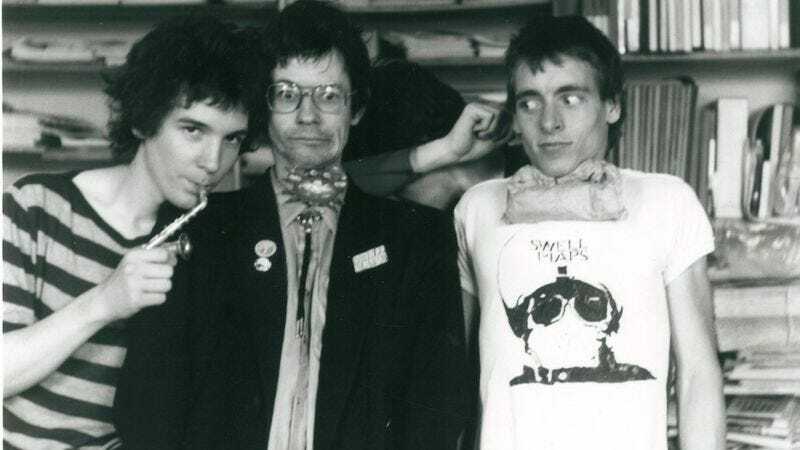 But Swell Maps never lost its yen for squelch-laden storm-bringing or its junkyard bric-a-brac approach to songwriting, and it would prove a huge influence on a generation of indie-rockers to come. One of those, Sonic Youth’s Thurston Moore, had this to say this about the first Swell Maps single he ever heard, 1979’s “Let’s Build A Car”: “It still to this day gives me a soul scorched buzz ’n’ rush. As soon as Nikki Sudden’s guitar comes slicing slabbing and all out fuzzifying off that crackling vinyl groove you know you’re gonna rock.” Listening to the song now, you can still hear what Moore heard—the germ of what would become the sounds of Sonic Youth and other Swell Maps acolytes like Pavement. At its root, “Let’s Build A Car” has a melody that someone like Paul Weller could have made into a charming little power-pop ditty. But Swell Maps run it through the grease-caked crankcase of guitars that sound like they’re not plugged in right and Sudden’s aloof, slightly off-key vocals. And just when you think it’s fallen into predictable punk sludge, Soundtracks layers in chiming piano chords, clear as a bell. The effect is something thousands of bands have tried to duplicate since—a noise with purpose; a beautiful mess. Though the group was short-lived, recording just two proper albums before disbanding in 1981 (with Sudden going on in a decidedly more Stones/Dylan direction in his solo career), its influence can still be heard today. Swell Maps did more than just build a car. It built a sound.